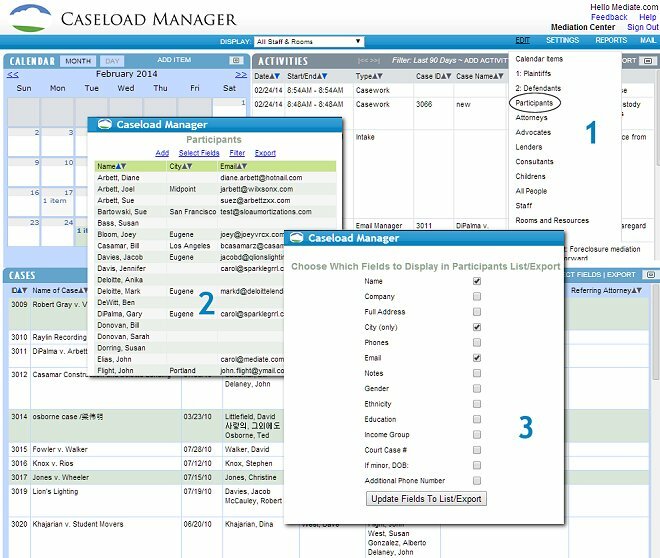 The Caseload Manager allows you to Select which fields are important to you to view, to display for future cases, and to export. If you want to create a back-up of your data on your home computer. This tutorial will walk you through how to select fields specifically for your Parties, but this process will also work for selecting information for your Cases, your Attorneys, and your Staff. 1) Navigate to the EDIT button. Click on it. When a menu drops down, click on Participants, the second option from the bottom. 2) You will see a new window pop-up that lists your participants. You will see the information about your participants that you have chosen to display. To change the information about your participants that you want to display, click the Select Fields link. 3) When a new window appears, check which fields you want to display. These fields are customizable. For information on customizing fields, click here. After you have selected your desired fields, you can then export that information to your computer by clicking the export button (always found to the right of the select fields button of the Case Bar, the Participants List, the Attorneys List, or the Staff List to export information on your Cases, Participants, Attorneys, or Staff, respectively). For more information on Exporting information, click here.